How would you like to see that coming at you?! I'm guessing he took this picture just before ducking into a tent for cover...or at least putting on those goggles to continue watching the sand storm roll in. That makes so much more sense! :) Thanks for indulging my curiousity! After I left that comment, I actually clicked on the picture and enlarged it to try and figure it out. Believe it or not, goggles were my second guess...!! 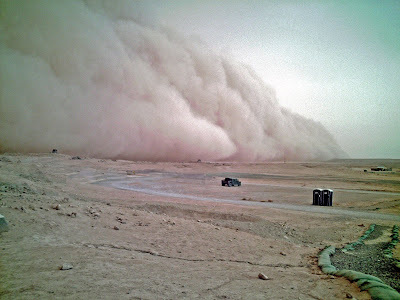 I can't imagine dealing with sand storms. Ugh!! Makes my eyes sting just thinking about it!